Romitaman Original Comic Book Art :: Private Collection :: Amazing Spider-Man #82 Cover (1969) SOLD SOLD SOLD! by artist John Romita Sr.
Amazing Spider-Man #82 Cover (1969) SOLD SOLD SOLD! Click Here To See Amazing Spider-Man #82 Comic book! 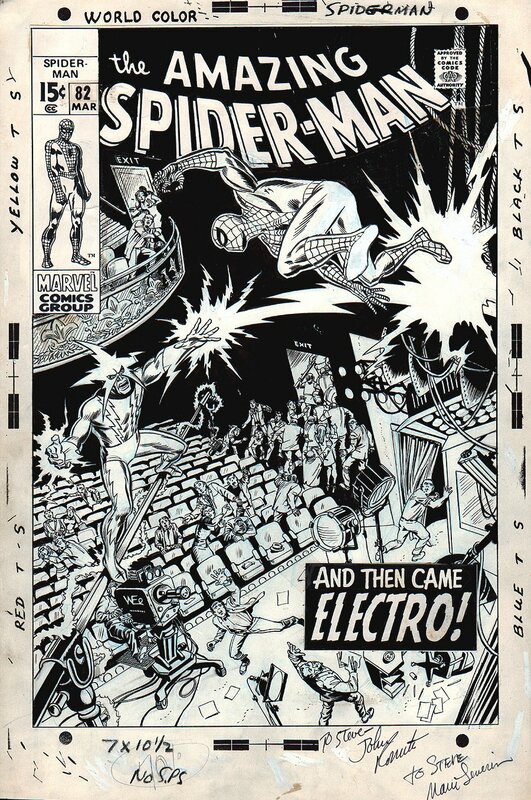 Check out this very nice 1969 AMAZING SPIDER-MAN cover, which was penciled by Marie Severin and expertly inked with incredible detail by the great John Romita, (with Marie doing some background inking also) This great looking cover is from the classic 1969 story titled: "And Then Came Electro!" 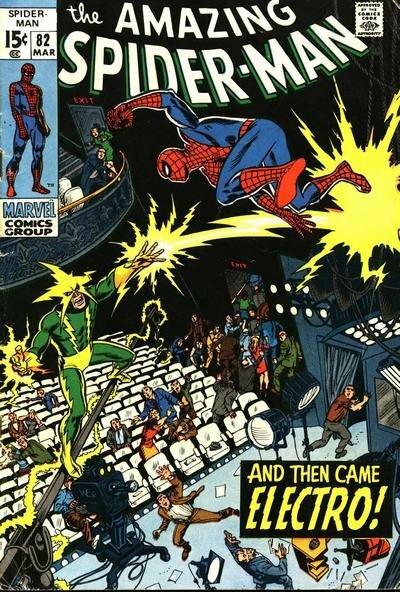 This nice cover features Full body shots of Spider-Man leaping away from Electro's energy blast as a whopping 34 (fairly detailed drawings of TV and audience) people run from they both battle! This is the FIRST time John Romita ever drew Electro and this is Spider-Man's VERY next battle with Electro after AMAZING SPIDER-MAN ANNUAL #1 back in 1964! The black ink backgrounds mixed with drawn action are quite striking on this stunning cover. There is whiteout touch ups on Spidey's left foot and buttocks. The cover art is actually drawn all the way up into and through the logo, and you will rarely find a more detailed 1969 Marvel cover than this one right here! Cover is signed by John Romita from back in 1969 as he was using his very early signature when he signed this one. Marie Severin also signed this cover right below John Romita! Compare this nice cover art to the published comic book in the red link above! ALL art on our website (including this one) are able to be purchased with VERY fair time payments, and trades are always considered towards "ANY" art on our website! Just send us an email to mikeburkey@aol.com and we can try to work something out.